The new Muscat International Airport, which opened last month, is expected to enhance the hub status of Oman and offer a significant boost to the sultanate's steadily growing travel and tourism sector. The stylish new state-of-the-art airport has been designed to be a symbol of the sultanate's progress and its culture and heritage. The arrival of an Oman Air flight from Najaf in Iraq on March 20 marked the beginning of operations at the airport. The flight was given a water cannon salute as it taxiied on the runway. All incoming and outgoing flights are now being operated from the new airport. Oman Air itself is operating up to 200 flights per day from the new terminal. The opening marks the completion of the first phase of expansion, which increases passenger capacity to 12 million. The airport is expected to undergo further upgrades in three consecutive phases, aiming to boost the number of passengers served to 48 million. The new runway will be able to accommodate the world’s largest aircraft, the Airbus A380, and independent parallel operations. The terminal has state-of-the-art facilities and offers 96 check-in counters, 6,000 sq m of duty free shopping, 8,000 parking spaces and a 90-room airside hotel. 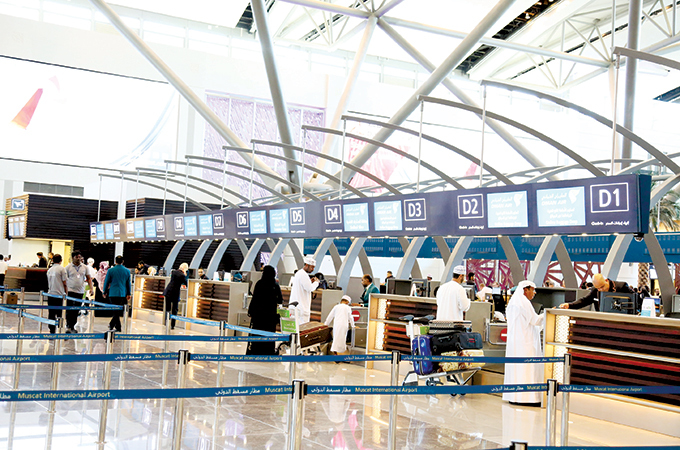 The airport also offers 16 self-service check-in kiosks to aid passengers and the baggage handling section is fully automated. Oman Air’s First & Business class passengers will be served separately through 12 check-in counters and three supervisor counters. There will be another 12 counters for other airlines’ Business Class passengers. The check-in area will provide the guests with premium concierge services. At the tastefully decorated premium check-in waiting area guests will not only be provided comfortable seating but will also be served soft drinks, as they wait to finish the check-in process. There are 29 contact boarding gates and 16 bus boarding gates. To mark the opening of the new terminal, Emirates flew one of its special ‘Year of Zayed’ Boeing 777-300ER aircraft to the airport, highlighting the ties between Oman and the UAE.